When you want to get pregnant and it’s not happening straight away it’s easy to place the blame directly on your body’s doorstep. After all, your body isn’t playing ball. It’s not regulating your hormones in the way it should, maybe you’ve been diagnosed with Endometriosis, PCOS, a blocked tube, premature ovarian failure, even if the doctors have found no cause, it must be your bodies fault right? If everything was working in your body, you’d be able to get pregnant with ease. But that’s not the whole story. We’ve often abused our bodies our whole lives. Eating crap, getting stressed to the eyeballs in jobs we hate, sitting at desks for hours on end, endlessly dieting and binging in a cycle created to oppress us. Our bodies were not made to live like this and they are calling out for our help! As a fat woman, I’ve spent my life believing my body wasn’t good enough. That I was less than because my body didn’t look like the pictures in the magazines. I didn’t believe that I was worthy of love, worthy to become a wife or a mother. But I am. I was born worthy. You do not have to achieve any goal, be a particular body type or change anything about you to be worthy of being a mother. Your body is sacred. Your body is going to create life and carry that life for nine months until your baby is ready to enter the world. No matter what you believe, that truly is a miracle and your body deserves to be treated with respect and nourished in order to be ready for that miracle. It’s time! It’s time to step up and treat your body with the respect that it deserves. 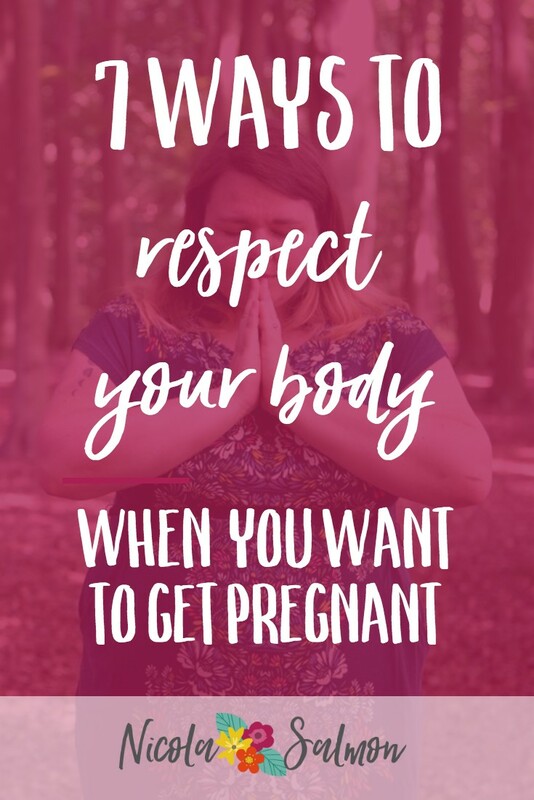 Not when you’re pregnant. Not when you’re skinnier. NOW. 1. Nourish your body with food that makes it feel good. Choose food that gives you energy (the good kind, not the rollercoaster kind), that makes you feel good. Eat mindfully, notice how the food tastes, how hungry or full you feel, how you feel when you eat it. Stop eating when you feel satisfied. Infuse your food with love and the intention that this food is going to make your body strong and healthy. Your body is designed to move every day. Find movement that brings you joy. Find ways to fit it easily into your life. Self care is not just bubble baths and spa days. It’s the act of choosing yourself each and every day, above everyone else. Choosing to put your needs first. It isn’t selfish. You can only help others when you are replenished. Think about what your needs are and ensure that you find a way to meet them every day. You have been bullying your body for a long time. Telling it that it’s useless, that it’s ugly, that it’s unworthy of anything. It’s time for that to stop. Pay attention to the thoughts you are thinking and the language you are using every day about your body. First spend some time noticing it. Then everytime you notice that you are using negative language, say in your head, “STOP, this is not useful” and flip it. If you were thinking “my tummy is so fat and ugly” say instead “my tummy is beautiful and soft” even if you don’t believe it. This is a practice so keep practising. Sleep is vital for every aspect of our health. Sleep is for the strong, not the weak. You need to prioritise it. Ensure that you are getting at least 8 hours each night. Keep all electronics out of the bedroom. Avoid blue light (phones, tv, laptops) at least 30min before bed. Keep an eye on what caffeine and alcohol are doing to your body. If you struggle with sleep, get some help. Talk about weight loss, bikini bodies and unrealistic beauty standards is everywhere. It’s difficult to escape it but if you want to create a loving relationship with your body there is no room for that negativity in your life. Do not be available for that kind of crap anyone. Unfollow anyone on social media who promotes that. Avoid newspapers, magazines and websites that promise you can lose 2 stone in 2 weeks. Change the subject with friends, family and work colleagues when these topics come up or if you feel brave enough, tell them that you are no longer interested in talking about these things anymore. Don’t buy clothes to aspire to, ones that you hope to fit in when you’ve lost weight. Don’t buy the first thing that fits, just because you can no longer bear the pain of clothes shopping. Buy clothes that make you feel amazing. Buy underwear that looks great (goodbye 10 year old granny pants!). Buy clothes that fit your body perfectly. You deserve to feel good each and every day. Download your free copy of The Fat Girl’s Guide to Getting Pregnant to discover three steps you can take to begin to unravel the messed up way we see our fat bodies when we are trying to get pregnant.